Manchester City put the disappointment of their Champions League exit behind them on Saturday evening, producing a brilliantly disciplined and clinical display to sink ​Tottenham Hotspur at Wembley. ​On paper, facing Spurs away from home hardly represented an ideal opportunity for the Sky Blues to get back on track after three successive defeats. Mauricio Pochettino's men had won their previous six ​Premier League matches and were on a 14-match unbeaten run in the league. 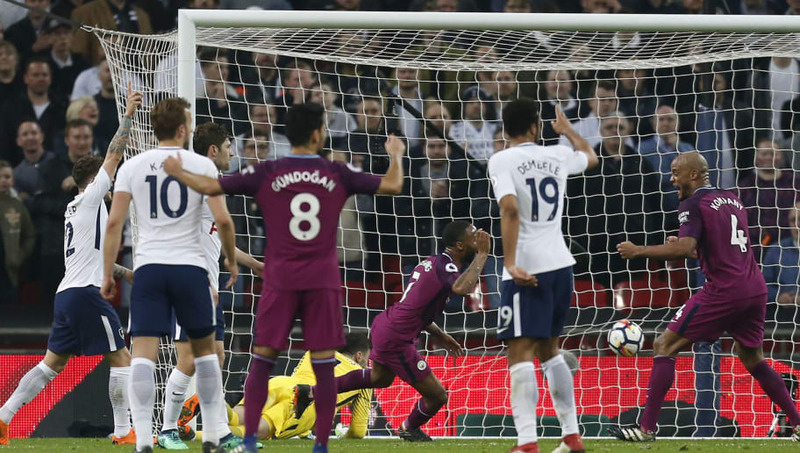 Yet if City were shaken by their uncharacteristically poor run of results, they didn't show it in the early exchanges at Wembley, dominating possession and hitting the post through a thunderous Leroy Sané volley, which left Spurs keeper Hugo Lloris rooted to the spot. Raheem Sterling and Kevin de Bruyne also wasted presentable opportunities in the opening ten minutes. Spurs struggled to gain a foothold in the match, and it was no surprise when Gabriel Jesus put City in front in the 22nd minute. The Brazilian beat a poor Spurs offside trap to get on the end of an excellent long ball by Vincent Kompany, before slotting emphatically past Lloris. Things soon went from bad to worse for the home side. Lloris made a rash, mistimed challenge on Sterling, earning himself a booking and conceding a penalty to City. The spot kick was duly converted with aplomb by Ilkay Gundogan in the 25th minute. Television replays suggested that Lloris had committed the foul outside the box, but if anything the 2-0 scoreline flattered Spurs, who could have gone further behind when Lloris saved well from a fierce David Silva strike in the 33rd minute. The home side were also arguably fortunate to finish the first half with a full complement of 11 players, with Ben Davies guilty of a horrific-looking challenge on Kompany. The Belgian was fortunate to escape without serious injury. Suddenly, seemingly out of nowhere, Spurs halved their deficit in the 42nd minute. The otherwise anonymous Harry Kane played a perfectly weighted pass through to Christian Eriksen in the box, who scored in the most fortuitous of circumstances, as his shot hit Aymeric Laporte and rebounded back off the Spurs man into the net. After the goal, Pep Guardiola's men suddenly looked brittle, just as they had in the second half against Manchester United the previous weekend. The half-time whistle didn't come a moment too soon for the Sky Blues. Spurs maintained their new-found momentum early in the second half, and now it was City who were struggling to regain the composure they had shown in the first 40 minutes of the match. Yet for all Spurs' tidy possession and a few promising attacks - such as when Davies narrowly failed to find Kane with a fine cross from the left - it was City who had the next clear scoring opportunity. Jesus was sent clear in the 64th minute, after another inept attempt by the Spurs defence to catch him offside, but he dragged his shot wide. Sterling missed another golden chance in the 71st minute after rounding Lloris, as his shot was blocked for a corner. However, the England winger would not be denied for long, firing in City's third from close range in the 72nd minute after Lloris had parried Jesus's deflected shot. 72. Lloris can only parry @gabrieljesus33's drive and @sterling7 is on it like a flash to smash home! By that point, Son Heung-min had replaced the ineffectual Erik Lamela, as Pochettino attempted to inject greater urgency into Spurs' forward play. Unfortunately for the home side, the South Korean was unable to show the attacking flair which has characterised his season. City spent the rest of the match in cruise control, and Ederson was not seriously tested until injury time, with the Brazilian parrying a powerful long-range effort from Lucas Moura. ​Manchester City's victory restores their 16-point lead over second-placed ​Manchester United. They will be crowned champions if United lose to ​West Brom on Sunday. Meanwhile, Spurs may be looking nervously over their shoulder, as fifth-placed ​Chelsea are now seven points behind them with five matches left to play.